China has launched a new round of government subsidies for new energy vehicles in September 2013, in a bid to further accelerate the development of green vehicles, promote energy saving and reduce air pollution. New energy vehicles in the renewal include pure electric vehicles, plug-in hybrid electric vehicles, and fuel-cell vehicles. The policy is also encouraging new energy vehicle purchases by government bodies and public transport sector. but it has widely been expected that hybrid subsidies will be released separately. The central government also announces that it will provide up to 60,000 yuan ($9,800) for the purchase of an all-electric battery car and up to 35,000 yuan for a "near all-electric" plug-in vehicle. The central government plans to have at least 10,000 new-energy vehicles sold between 2013 and 2015 in three metropolitan areas surrounding Beijing, Shanghai and Guangzhou, while other cities are set to get 5,000 units each during the same period. BYD,CHERY, Volkswagen, GM, VOLVO and other car makers are now rallying again to implement tailor-made strategies and to bring new energy vehicles to China to meet customer's need, and to start the localization of green vehicle technology and production in China to enjoy government subsidies. Chinese government and auto makers are pushing hard to achieve countrywide mass adoption of electric vehicles. The Ministry Of Industry And Information Technology announced that there will be at least 500 thousand pure EV and PHEV on road by the end of 2015. And in 2020, the number will reach 5 million. Experts estimate that, within 10 years, China will become the biggest new energy vehicles market. To support new energy vehicle introduction in China, SGCC, China's largest power grid state company plans to build a total of 2,351 EV charging facilities and battery-swap stations, and 220,000 charging poles to meet the growing needs of the EV industry in the next five years. However, there are clouds remains that might be shading the seemingly bright and promising future, including poor charging infrastructure roll-out, divided technology standards, immaturity of HEV technology for commercial-scale production, uncertainty of subsidy policy and business model challenges etc. The 2nd annual New Energy Vehicle and Charging Technology China Summit 2014 will gather auto OEMs, electricity utilities, governments, battery developers, standardization bodies, consultants and technological solution providers together to share visions and insights on how to interpret China's New Subsidy Policy, share car maker's NEV production roadmap and strategy as well as share latest battery, charging and power-train technologies. 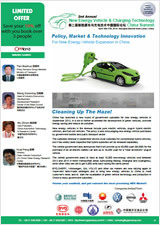 The official website of New Energy Vehicle & Charging Technology China Summit . Copyright © 2009 Oppland Corporation, All rights reserved.